Geologists examined the different layers of rock and started to question the biblical idea of a flood. There was much debate about the glacial age, and the Town Library has many books about glaciers and about Switzerland, where people went to study them. People saw that the earth had been formed over many ages and that some very strange creatures had preceded man. Sir Richard Owen was the man who invented the word "dinosaur" and became famous as an expert on these newly discovered fossilized creatures. Although quite poor, Owen gained experience in anatomy by performing post mortems as a surgeon's apprentice and went on to study anatomy at Edinburgh University and at St Bartholomew's Hospital, London. He was put in charge of stuffing and cataloguing the Hunterian collection of animal specimens which had been brought from expeditions abroad, and in this way he became an expert on animal bones and comparative anatomy. This made him well qualified to examine and classify many of the strange fossilized bones which fossil hunters like Mary Anning and Gideon Mantell collected and studied. had column-like legs instead of the sprawling legs that other reptiles have. He said that all these fossils belonged to a class which he named "dinosaurian" from the words "deinos" meaning "terrible" and "sauria" meaning "Lizard." 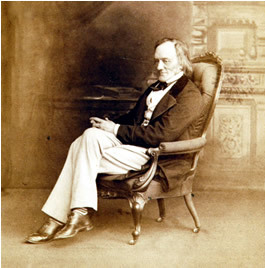 Richard Owen was later a fierce opponent of Darwin and Gideon Mantell. He did not believe in evolution; his papers on dinosaurs were published partly in an attempt to forestall early ideas about evolution, which he thought were ungodly. Ironically, his work actually helped support the evolutionists arguments.